Philips Lumileds (sponsor of this site) announced a new high-power addition to the Luxeon product line. The Luxeon Q claims high efficacy maintained at high currents. 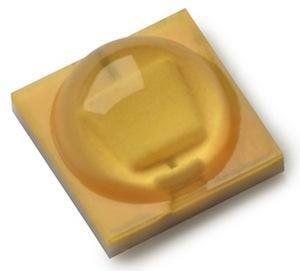 The Luxeon Q (product brief; datasheet) is a phosphor-converted, 3.5mmx3.5mm packaged LED that can directly replace emitters in a standard 3535 surface-mount package. It exhibits an efficacy of 135 lm/W at 85°C and 5700K CCT, 70 CRI, and 350 mA. Under the same conditions at 3000K and 80 CRI, the efficacy is 115 lm/W. The new product's selling point is maintaining a relatively high efficacy, and high flux, as the drive current increases. The press release cites an efficacy of 102 lm/W for a 4000K LED driven at 1A, again at a junction temperature of 85°C. Lumileds claims that this achievement is possible due to a combination of a high plug-efficiency blue source LED and advances in light extraction and conversion techniques. When Lumileds re-entered the business of selling bare blue dice last February, it did so in a new chip-scale package (CSP) architecture. In this configuration the sapphire substrate on the LED die is left in place, instead of being removed prior to packaging, as was done in the company's initial thin-film, flip-chip architecture. At the time Lumileds claimed a wall-plug efficiency for the bare die of 56 to 61 percent, an industry high. This blue die powers the Luxeon Q, and the remnant sapphire is instrumental in its light-extraction efficiency, according to LEDs Magazine. The magazine ran through a datasheet comparison of the Luxeon Q with a roughly equivalent Cree LED, the XT-E. At 350 mA of drive current, the two LEDs put out essentially the same flux, 123 lm and 122 lm respectively. When the drive current is increased to 1A, the Lumileds product enjoys about a 10 percent advantage in efficacy, producing 293 lm to the Cree's 281. Lumileds stresses the advantage to luminaire manufacturers of the industry-standard 3535 form factor with a standard beam distribution. It allows not only drop-in replacement of earlier LEDs, but also the support of a well developed ecosystem for optics and other components to speed development. The Luxeon Q is available in CCTs from 2700K to 5700K. The CRI is 80 for those products on the low end of the CCT range, and 70 for those at 4000K and above.